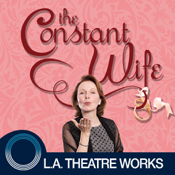 The Constant Wife (by W. Somerset Maugham) is presented by L.A. Theatre Works. This standalone audiobook app combines a professional audio recording with supplemental features for download-once, grab-and-go anywhere enjoyment. There’s something Constance Middleton’s friends are dying to tell her: her husband is having an affair–with her best friend! Despite their hints, Constance remains ever cool, and seemingly oblivious. Or is she? In this biting comedy of manners, marriages and mistresses, Constance–a not-so-desperate housewife—has some ideas of her own about extra-marital activity that surprise everyone in the end! John De Lancie as John Middleton, F.R.C.S. Directed by Jeanie Hackett. Recorded before a live audience at the Skirball Cultural Center, Los Angeles.